This document is a companion to the Feide Integration Guide. It is recommended to read that document for a conceptual and architectural introduction to Feide. In this document you will find a more thorough discussion of the technical side of becoming a Feide integrated service provider. The first part of this document discusses how Feide implements SAML, and the next part gives an overview of the Feide user attributes. Security Assertion Markup Language (SAML). is a protocol framework for federated identity management. SAML is an XML-based standard. The Feide Identity Provider (IdP). There are many choices left to the developers when it comes to implementing SAML inside and across organizations. Interoperable SAML 2.0 Profile is an effort to specify a “least common denominator” for SAML federated Web based Single Sign-On (SSO). There is also a profile for single logout (SLO) deployment. The Feide configuration is based on these two profiles. There are pre-made SAML handling libraries for the major web development platforms. We urge you to use one of these unless you have a compelling reason to do otherwise. To do a robust implementation of SAML protocol handling is a major undertaking. It is written more about available software and integration in Feide Integration Guide in the chapter Choose and deploy SAML 2.0 Service Provider software. During user login and logout SAML messages are communicated between the SP and IdP. How the messages are transmitted between IdP and SP is explained in Bindings below. When an SP wants to authenticate a Feide user, an authentication request is sent from the SP to the IdP. The message is sent by redirecting the user to the IdP web page for authentication. Unique ID for the request. The authentication response refers to this ID. Destination endpoint URL for this request. This information is taken from the IdP metadata that have been imported into the SAML software. ProtocolBinding indicates how the response message is to be transported from the IdP to the SP. Bindings are briefly explained in Bindings below. AssertionConsumerServiceURL is the destination URL for the authentication response message sent back from the IdP to the SP. Issuer is the entityID for this service. Upon successful authentication the browser is by HTTP-post binding, instructed to post the authentication response message to the AssertionConsumerServiceURL at the SP. A typical authentication response is shown in example 2. The Assertion part of the message is separated out and shown in example 3. InResponseTo refers to the message ID in the AuthnRequest message. Issuer is the entityID for the IdP. The value of the StatusCode indicate whether the authentication was successful or not. The assertion is signed to prevent tampering of the message. SessionNotOnOrAfter indicates the lifetime of this assertion. Session timing is discussed in The user’s Feide session below. The SessionIndex is an ID for the IdP session. The value of AuthnContextClassRef indicates how the user was authenticated. Feide only supports password at the moment, but this may change in the future. In the Assertion you will also find an AttributeStatement. The attributes transmitted to the SP is contained in the AttributeStatement. You find a description of the formatting of the attributes in SAML Assertion below. Feide supports logout from one single service at a time or Single Logout (SLO) from all the services in the Feide federation where the user is logged in. A LogoutRequest message is sent to an entity to request a logout from that entity. That entity responds by sending a LogoutResponse message. The LogoutResponse indicates whether the logout was successful or not. Depending on the mode of logout the SP may send a LogoutRequest to the IdP or receive a LogoutRequest from the IdP. The SLO modes are explained in Logout SLO. NameID is an identification of the subject (the user) of the messages and has to match the NameID in the Assertion message, here shown in example 3. The SessionIndex is the SessionIndex from the login assertion. The InResponseTo value is the ID from the LogoutRequest this is a response to. The value StatusCode indicates whether the logout was successful or not. The bindings specify how the SAML messages are transported between the SP and IdP. As specified in the SAML profile, Feide only uses the HTTP-redirect and HTTP-post bindings. This means that all SAML messages are transported through the user’s web browser, piggy-backed on the various HTTP requests and replies. This is called front-channel communication. It eliminates the hassle of establishing a direct communication path between SP and IdP. The binding can be illustrated by the login transaction as shown in illustration 1. The user tries to access a protected web page at the SP. The SP SAML functionality instructs the user’s web browser (by redirect) to visit the login page at the IdP. An encoded version of the AuthnRequest is appended to the URL. Upon successful authentication, the web browser receives a page including a hidden form control. The authentication response is encoded in this form. The browser is also instructed by a script to post this data to the SAML consumer endpoint at the SP. The same principle is used for logout, except that logout only uses redirects. For securing SAML communication, Feide relies on SSL/HTTPS security. This means that the SAML messages are encrypted in the communication channel between the user’s browser and the service endpoint and the browser and the IdP endpoint. But the SAML messages pass through the user’s web browser unencrypted. To prevent tampering of the assertion message on the user’s client computer, the Feide IdP signs the assertion message in the authentication response. The Feide IdP’s public certificate is embedded in the metadata for the IdP. Profiles define specific sets of rules for using SAML for a specific task. The following chapters is a summary of the login and logout profile used in Feide. Feide is loosely based on the Interoperable SAML 2.0 profile specification. This is a summary of the specification, adapted to its usage in Feide. Uses either the HTTP-redirect or the HTTP-POST binding. Please note that even though the HTTP-POST binding is allowed for sending authentication request messages, the use of the HTTP-redirect binding is recommended and encouraged. Should, for the NameIDPolicy, set AllowCreate to true. Should, for the NameIDPolicy, set nameid-format to transient. SP must support unsolicited responses. This is to support the cases where the user bookmarks the IdP login page. Attributes name formats is basic. More information about attribute names in SAML Assertion. SAML endpoints must use SSL/HTTPS. The Feide IdP supports Single Logout (SLO). The SPs have to handle two different scenarios to properly handle SLO. 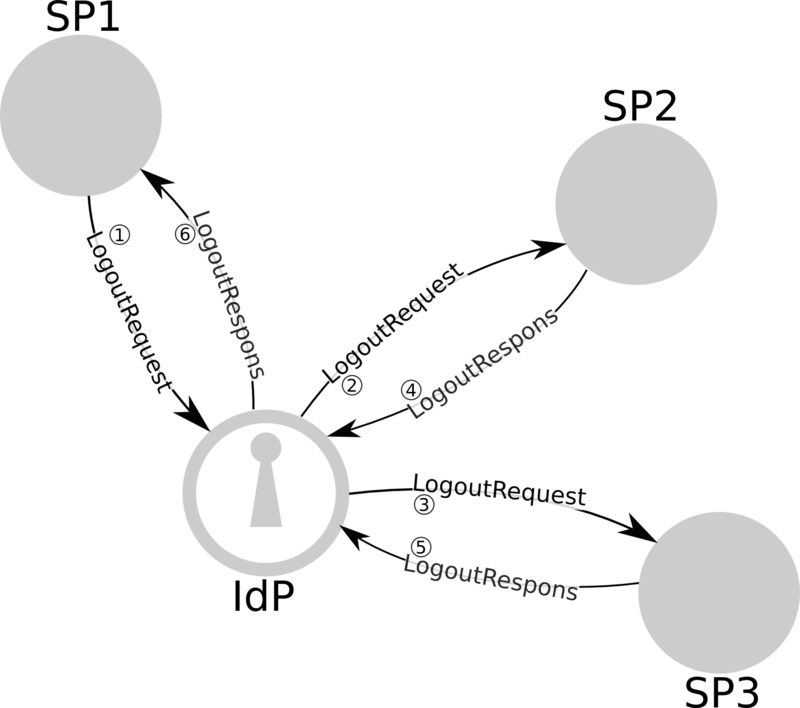 Illustration 2 shows an example where one user is logged into three SPs. When the user chooses to logout from SP1, then SP 1 initializes a logout by sending a LogoutRequest to the IdP. Then the user selects to logout from all the services. The IdP initializes logout on the rest of the SPs (SP 2 and SP 3) by sending a LogoutRequest to each of them. The SPs will perform a local logout and respond to the IdP by sending a LogoutResponse message back to the IdP. When the IdP has completed all the logouts it will respond to SP 1 by sending a LogoutResponse message to SP 1. The user may initialize a SLO from any of the SPs. This means that any SP should be able both to send LogoutRequest messages and to respond to incoming LogoutRequest messages from the IdP. Summary of the Front-channel SAML 2.0 Single Logout Deployment Profile. Should be able to initialize Single Logout from the service by sending LogoutRequest message to the IdP. Should be able to handle incoming LogoutRequest messages from the IdP. If it is able to initialize Single Logout, it must be able to handle incoming LogoutResponse messages. Handles Single Logout initiated by any of the connected Service Providers. Interact with the user to let the user select SLO or only logout from the IdP and the SP where logout was initialized. Sent by either the HTTP-redirect or HTTP-POST binding. Please note that even though the HTTP-POST binding is allowed for sending authentication request messages, the use of the HTTP-redirect binding is recommended and encouraged. When the user does a “fresh” login on the IdP for the first time, an IdP session is created. The user’s attributes are fetched from the home organization and are cached in the session storage. The IdP session has a lifetime of 8 hours from the username and password is entered. During this 8-hour session the user will be able to directly access services without entering the username and password again. If the user tries to access a service after the 8-hour session has expired, a new Feide login is initiated and a new 8-hour s ession is created. 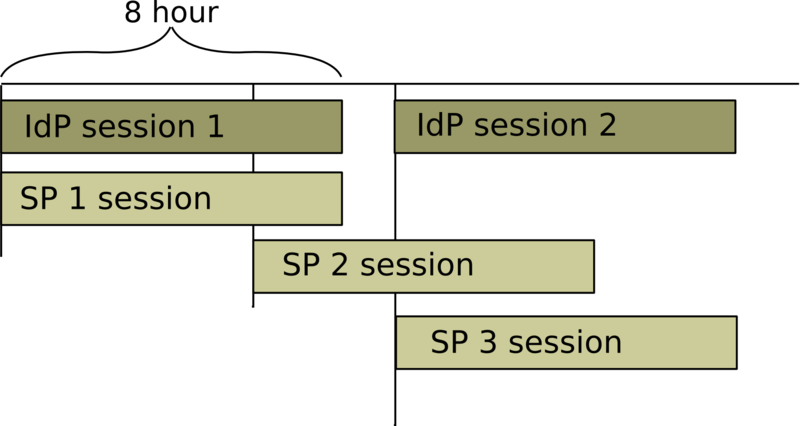 A new session is created on each SP when the SP receives the assertion from the IdP. The SP session lifetime is also set to 8 hours. In the assertion part in the authentication response message is an AuthnStatement tag (example 6). This tag contains some attributes relevant to session timings. The SessionNotOnOrAfter attribute is a time stamp set to 8 hours after the authentication assertion was sent. The SP must adhere to this time limit and initiate a new login if the user tries to access the resource after this time has expired. The user selects to logout. The user closes the web browser. The IdP and SP sessions cookies are automatically deleted. The IdP session is automatically terminated 8 hours after the username and password was entered. The SP session is automatically terminated 8 hours after the SP received the assertion. Before your SP and the Feide IdP can operate in a federation, the entities must exchange SAML Metadata. Feide operates both a test IdP and a production IdP. Metadata must be generated for your SP. This is usually done by the SAML library you are using. A SP metadata example is shown in example 7.
entityID This is a unique ID for your service. It should either be a URN or a URL. SingleLogoutService The Location attribute is the URL where logout requests and responses are handled. If this endpoint is available, it must be able to both send LogoutRequests and to handle incoming LogoutRequests. AssertionConsumerService The Location attribute is the URL where authentication responses sent from the IdP will be posted. If the entityID is a URL it should be a URL pointing to the metadata for the service. no for Norwegian service providers or the ccTLD for the country of origin of the service provider. The subdomain name for the service provider. A descriptive name for the service offered. The name should be unique in the service providers DNS namespace. The entityID in example 7 shows a URN formatted entity id. User attributes carry different pieces of information about the user, the user’s home organization and the user’s school. It may be information like name, role, school affiliations etc. When the Feide IdP has successfully authenticated the user against the user directory at the user’s home organization, the Feide IdP will retrieve a set of attributes from the directory. After the Feide IdP has retrieved the attributes, it will process and filter the attributes before it passes them on according to the agreements between Feide and the SP. The norEdu* Object Class Specification describing how the attributes are organized. The norEdu*-specification is based on eduPerson, eduOrg and some other LDAP schemas. Feide requirements for primary and secondary education. Feide requirements for higher education. These two parts are organized different as regards to ownership and internal structures, which affects the Feide information model. Essential to the Feide information model is that each person is associated with one top organization (the home organization) and possibly one or more organization units. This is shown in illustration 4. 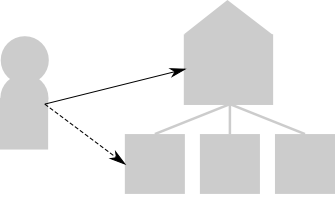 Illustration 4: All Feide users are associated with one home organization and possibly one or more organization units. For students, employees and other persons in higher education, the home organization is the university / university college. Organization units are various faculties or departments within the top organization. There is no requirement that a person in higher education should be associated with an organization unit, and Feide puts no requirements on which attributes should be registered for organization units in higher education. Illustration 5: A pupil must be associated with both a top organization and at least one organization unit. 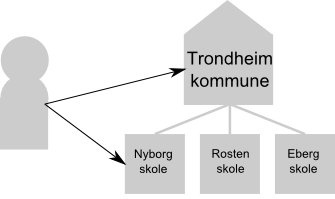 In this example, the top organization is Trondheim kommune (the municipality) and the organization unit is Nyborg skole (the school). Because of different organization and owner structures in primary and secondary education, the Feide information model for primary and secondary education is different from higher education. For pupils, teachers and other persons in primary and secondary education, the home organization is the owner of the school, in most cases the municipality/county. All the schools owned by the same municipality/county, are organization units under the home organization. All persons in primary and secondary education are associated with at least one organization unit (one school). Feide puts specific requirements on which attributes should be registered for organization units in primary and secondary education. An example on how this might be, is shown in illustration 5. If the service is to do authorization based on school affiliation, it’s crucial to understand how higher education and primary and secondary education is represented in Feide. See table 1 for a summary of the differences between higher education and primary and secondary education. Table 1: A summary of the differences between higher education and primary and secondary education. The availability of attributes is governed by the norEdu* Object Class Specification together with the Feide requirements for primary and secondary education and higher education respectively. These documents state what information should be registered about each user and how the user directory should be organized. The norEdu* Object Class Specification has been released in several versions. As a result of this, some organizations are using an older version of the specification and do not necessarily have all the attributes required by the latest specification. A list of user attributes available for services is available here. When it comes to selecting a user ID we have to balance between two conflicting demands – the services’ demand for a unique and persistent id and the users’ demand for anonymity and privacy. eduPersonTargetedID: This ID gives anonymous user authentication, but still gives the service the ability to track a particular user from login session to login session. This ID is different on different services for a particular user. eduPersonPrincipalName: This is the “Feide ID”. This is a valid and unique user ID as long as the person is a member of an educational institution. norEduPersonNIN: This is intended as a lifelong personal identity number. In the cases where a key is needed to combine information from other governmental information sources, this ID can be used. Contains the school’s organization number, which uniquely identifies the school. If there is a primary school registered for the user, this school is listed first. For users in higher education, only the organization number of the home organization is listed. For pupils in primary and secondary education it is intended to populate the eduPersonEntitlement attribute with Grep-codes. Grep-codes can be used to express a pupil’s grade, subjects, major area etc. For further information please contact Feide. 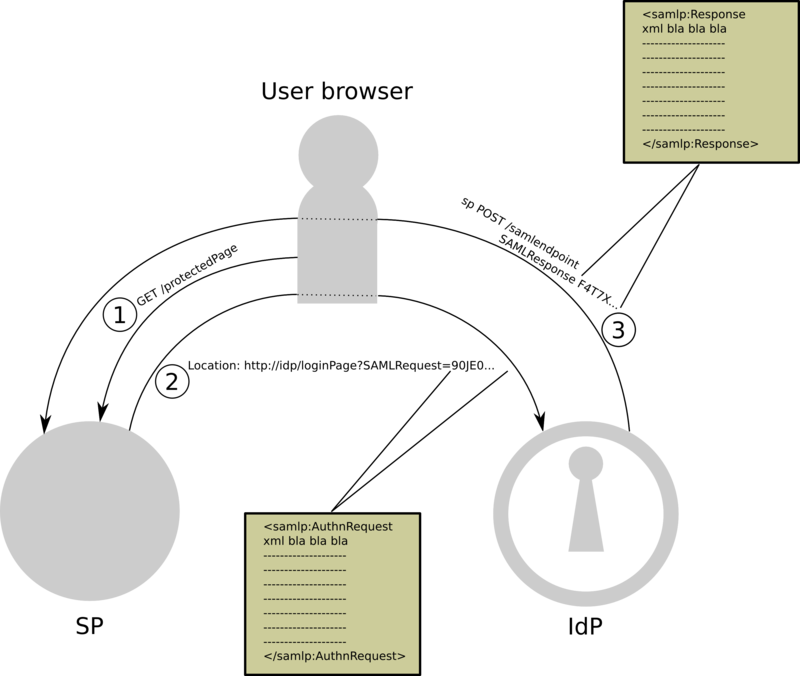 The attributes are transmitted from the IdP to the SP wrapped in SAML assertion. The SAML specification only specify an attribute name-value pair relationship. It does not specify how to map a tree like information structure into a flat name-value pair message structure. This chapter will explain how Feide organizes this information in the SAML assertion. User identity values like eduPersonPrincipalName is by definition case insensitive. However, Feide preserve cases for attribute values and some home organizations have saved the values with both uppercase and lowercase letters. We therefore recommend doing case insensitive matching when eduPersonPrincipalName is used as a user identity key in the SP system. All attributes carrying information about the user’s home organization are prefixed by “eduPersonOrgDN”, and all attributes carrying information about the user’s organization units are prefixed by “eduPersonOrgUnitDN”. The prefix and the attribute name is joined with colon (:). The notation is shown in example 8. The SAML assertion message snippet in example 9 shows an example where eduPersonAffiliation has multiple values. There is no particular ordering of the attribute values. The user may be tied to several orgUnits. The Feide IdP does some custom mapping to be able to convey this information to the service via the assertion message. The value for each attribute name in each orgUnit object is grouped together as a multivalued attribute in the assertion message. This mapping is illustrated in 6, and example 10 shows an example message. This mapping is done consistently, so for each attribute name in the assertion message, the first value is always from the first orgUnit object and so on. An empty value is inserted if an orgUnit object is missing this attribute. This mapping alters the semantic meaning of multivalued attributes in the assertion message for orgUnits. So, in the cases where the orgUnit attribute is already multivalued, this has to be encoded in a different way. The multivalued attributes are joined together with the pipe (|) symbol as a separator. Example 11 shows an example where the ou attribute have two values. This chapter describes which tests you should complete to verify the Feide integration of your service. Feide has some infrastructure to facilitate integration testing for service providers. To start testing your service, it must be integrated with the Feide test IdP. This is done by exchanging metadata with this IdP. Feide has a test user. Tests no. 1 and 3 are core requirements. Tests no. 2, 4 and 5 are optional and tests your SP’s ability to handle “IdP-first flow”. This will occur if the user bookmarks the IdPs login page. 1 SSO, your SP first While not logged in:Log in from your SP. Then log in from the Feide test SP. When logging in to your SP, you are directed to the IdP login page and you have to enter your credentials. When logging in to the Feide test SP, you are granted access directly without entering credentials. 2 SLO, your SP initializes While logged in to both your SP and Feide test SP: Start logout from your SP. Select to log out from all services when prompted at the IdP logout page. Verify that the IdP logout page lists the Feide test SP. When logout is completed, verify that you are logged out from both services. 3 SSO, Feide test SP first While not logged in: First log in to Feide test SP then log in to your SP. Verify that you are granted access to your SP directly, without entering credentials, after you have logged in to the Feide test SP. 4 SLO, Feide test SP initializes While logged in to both services: Start logout from the Feide test SP. Choose to logout from all services when prompted at the IdP logout page. Verify that the IdP logout page lists your SP. When logout is completed, verify that you are logged out from both services. 5 Login from bookmarked IdP login page. While not logged in: Start login from your service and bookmark the Feide login page. Restart your browser and open the bookmark. Complete the login operation. Verify that you are granted access to your service. Your SP is not logged out after completed SLO in test #4. Your SP is not configured to properly handle incoming LogoutRequest messages from the IdP. See "Front-channel SAML 2.0 Single Logout Deployment Profile"
Feide IdP-test stores a cookie in your browser. The name of this cookie is SimpleSAMLSessionID. You can delete this cookie when you do trial and error testing, to get back to a “clean state”.